Today’s show is about the four quadrants of how I approach serving people to grow their businesses and careers. They’re quadrants, not in the mathematical sense, but only in the sense that there are four of them and I don’t prioritize them. Well, that’s not actually true because I do intensely focus on quadrant 1 and all the work I do stems from that one. But my approach is quite holistic. I work on all of these simultaneously with clients. Quadrant 1 is the trifecta of business building: getting new customers, serving existing clients better and not going crazy in the process. The business world has labels for each of these. Getting new clients is sales and marketing. Serving existing customers is work flow, systems and processes. Not going crazy in the process is about leadership and management. We lead people. We manage the work. 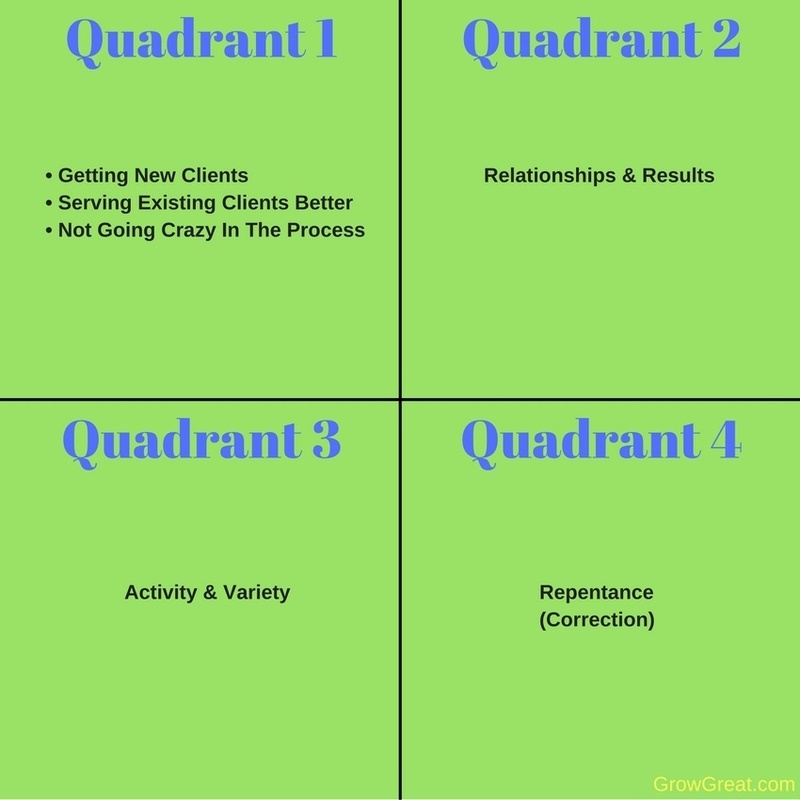 Quadrant 2 is about relationships and results. Sometimes I find that we have to first address the issue of capacity. If a team member lacks the skills to get the job done well, then results aren’t going to happen no matter how much work we put into the relationship. However, if people have the capacity to do the job (and presumably to do it well), then we should expect good results. Our relationship has a direct impact on that. If you don’t think so, then you don’t pay attention to college or professional football (the North American kind) and the hiring or firing of coaches. Sometimes talented teams don’t perform up to expectations because the coach is doing a poor job relating to or training the team. Quadrant 3 is activity and variety. The adage is, “Give it to a busy man if you want it done.” That’s because we know that the person who appears to have enough margin in life to devote to something…well, they often don’t get around to it because they’re mostly in the habit of not doing anything. Instead, we give it to the person who is already busy and it gets done because that person has formed the good habit of doing thing. As for variety, well, I think that counts for quite a lot. Putting ourselves in positions of expanded opportunity and relationships is the way to greater growth. That’s important since the podcast is called GROW GREAT. Quadrant 3 is repentance. Yes, that’s a spiritual term and don’t everybody likes it. That’s fine. Call it correction is you please. Same thing. We need to face up to our transgressions, own then, then fix them while turning the page. In some upcoming shows we’ll dive more deeply into each of these, but for today we’re taking a drone’s view of all four. I hope you find it profitable for growing your business and your career.